As Dear Lucy begins there is a sense that the narrator, Lucy, is a bit off. Her determination to be acknowledged as good and useful is extreme and the lengths to which she goes to be heard become almost violent. It’s a bit unnerving and immediately grabs the reader’s attention. Lucy is unique, but in what way? Very quickly we learn that Lucy is a “bad sort of girl”. She lives with Mister and Missus on a farm because she was too difficult and different for her mother to handle. On the farm she does chores, one of which is getting the eggs for breakfast from the chicken coop. She loves the eggs and the fact that they give their life for hers. Unfortunately, when she doesn’t follow Mister’s instructions and the eggs break she is no longer allowed near the coop. This triggers her over-reaction, because being a “good girl” is all Lucy wants. If she is, her mother will come back to get her. She promised and if there is one thing Lucy believes in, it is the power of a promise. 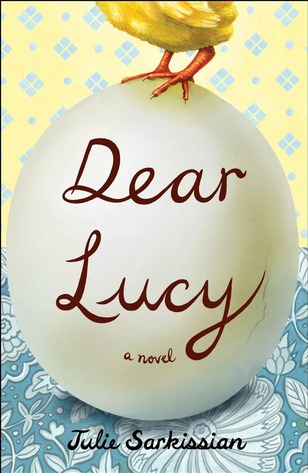 Debut author Julie Sarkissian creates one of the most unique voices in fiction in Dear Lucy, in that Lucy is developmentally disabled. She comprehends the world in absolutes and with limited understanding. When she learns that if left unbroken eggs become chickens she secretly takes several, bundles them up in a soft sweater and puts them in her drawer. Every morning she takes them out and gently holds them, talking to them, thinking that this is part of “the secret of growing”. When Missus discovers the rotten eggs and takes them away she is inconsolable—she believed she was giving them life. There are two other narrators in Dear Lucy. One is Missus, with her own secrets. She has the same abiding belief in the power of family but unlike the clear waters of Lucy’s mind, hers is much deeper and muddied. If Lucy is all surface then Missus is a sinkhole—nothing to see until it is too late. The other narrator is Samantha, a troubled teenager who is pregnant. Like Missus, she has much going on beneath the surface but like Lucy she is still open and giving. Her kindness towards and interest in Lucy makes them fast friends. From each, the other learns that she has value despite what she has been told. Unfortunately, it is also from Missus and Samantha that we hear the harsh realities of life, but for Lucy, in not being able to understand either the subtlety or darkness of human emotions, there is only the simple fact of love and family. To sculpt a character like this requires great emotional delicacy but also technical skill. Crossing the line into caricature is a hazard but it is not a line Sarkissian approaches. Instead, Lucy is a young woman who, while not able to finesse a bad situation or see past the next moment, knows what is right. When Samantha and her baby disappear she knows she must find them and bring them together again, because that is what makes a family. However, she has promised her mother she would never leave the farm so when her mother returns she would be able to find her. The conflicting promises tear at her until the appearance of an unusual new friend named Jennifer. Jennifer’s assertive nature and ability to speak so only Lucy can hear her, provide the street smarts and plan-of-action that she needs. Sarkissian’s ability to move between the clear simplicity of Lucy’s mind to the more complex intentions of others means that Dear Lucy will capture the reader at many levels. Inasmuch as there is no duplicity in her thoughts there is an abundance of it in the world around her. After Samantha has her baby and Lucy embarks on her efforts to make everything right, events accelerate and the true nature of each character is revealed. The ever-earnest Lucy takes the initial action she needs to, but is unable to formulate a plan beyond that. For the reader, Sarkissian’s simple but powerful prose merges us so deeply with Lucy that we not only feel the depth of her emotions but her uncertainty about what to do. We, too, are left in a place of not knowing what will happen next.